Replacement:DEV-11262. The new version of this board is easier to snap apart! This page is for reference only. In this version, we've changed the labeling on the LEDs to make more sense. We've also connected the speaker to ground so that only one I/O pin is required to get the buzzer working! The LilyPad Development Board is a sewable electronics prototyping board that you can use to learn circuits and programming with Arduino, then break apart to make an interactive fabric or wearable project. Learn how to program in Arduino with the LilyPad Development Board. 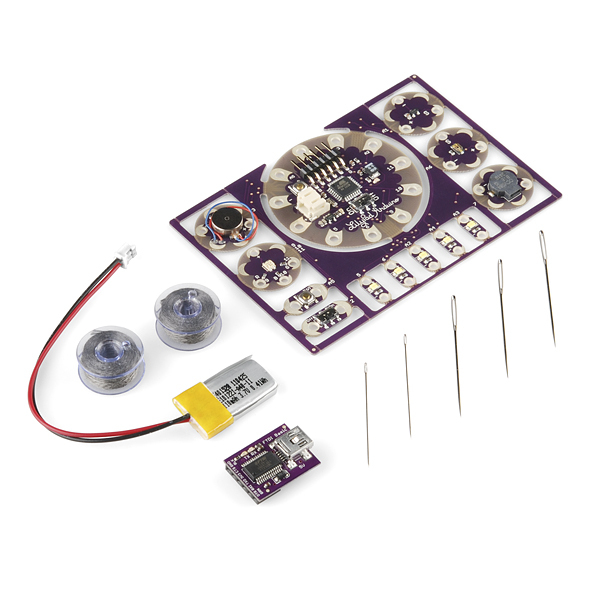 This guide includes 11 example activities that use the pre-wired LilyPad boards on the LilyPad Development Board. The picture shows a tiny LiPo battery, but the parts list doesn't include it. It does come with it. It's fixed now. I'm wondering the same thing myself... I think it doesn't... since there's also a picture of it with a USB cable and the text mentions that the cable is not included? Because this is a Lilypad board the parts are designed to be sewn into things with conductive thread, each board has pads broken out, you will need to figure out which connections you need and then sew those connections in with conductive thread. If you have any other questions email us at techsupport. How is the battery charged? Do I need to buy something else? Did you find out the answer? About how long should the 110mAh battery last?